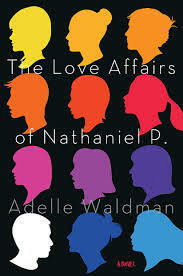 Tag Archives: The Love Affairs of Nathaniel P.
This debut novel by Adelle Waldman follows a year in the life of Nathaniel, aka Nate, a 30-something free lancer and aspiring writer in New York City. Told from his point of view, it examines the progression of his career and his love life. Nate is starting to achieve some success in his field, and he is both arrogant and insecure. When he gets involved with a smart, witty writer who is also struggling to make it, has he found true love? Will he stop being such a jerk? Or will we root for the woman, Hannah, to dump him before he does a number on her, too? The novel opens with Nathaniel on his way to a party at his ex-girlfriend Elisa’s place. He bumps into another ex on the street en route, and she is clearly none too pleased to see him. Nate is affronted by her reaction and thinks of himself as the better person for having tried to be polite and friendly, but he clearly has no idea of how he looks through another’s eyes. He thinks throughout the novel that he understands how others think, and he is an adept at twisting other’s reactions and words to back up his own convictions. This sometimes causes him to feel pangs of guilt but he usually manages to overcome them. Nate is a misogynist and sexist, although he thinks it impossible that he could be so, having been raised in a progressive household and having attended the finest schools. A bit of a nerd in high school and at Harvard, Nate has cultivated a “sensitive guy” vibe and considers himself an eminently reasonable fellow, although he is sort of like Professor Henry Higgins in My Fair Lady — an intellectual who behaves like a cad. Nate’s friends make for some interesting reading, too. They are all writers struggling to become successful and are all rather pretentious. They reminded me of grad students I knew (and was) back in the ’90s. Maybe this is why, as obnoxious as they can be, I can put up with them. I knew people like Nate — guys whose identity is caught up in their “important work” and who think that their intellect entitles them to condescend. They’re smart enough to be interesting and witty, but there’s a whole lot less substance and more insecurity there than one might perceive initially. The characters to me seemed very realistic, but I do wonder if a male reading this novel might have a different point of view on Waldman’s male characters.